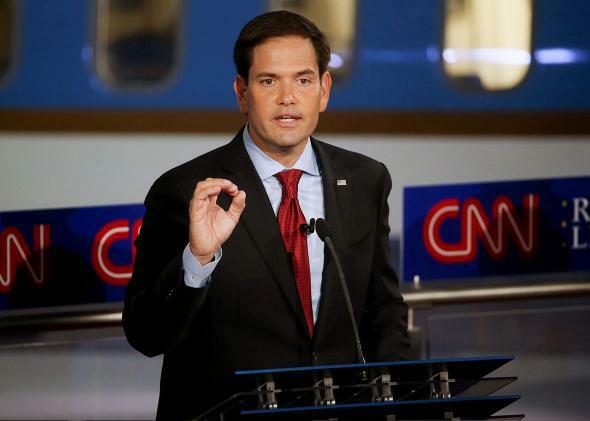 GOP debate: Marco Rubio’s terrible answer on climate change. Florida Sen. Marco Rubio at the Reagan Library on Sept. 16, 2015, in Simi Valley, California, Planet Earth. We received a lot of questions from social media about climate change. Senator Rubio, Ronald Reagan’s secretary of state George Schultz reminds us that when Reagan was president he faced a similar situation to the one we’re facing now, there were dire warnings from the mass consensus of the scientific community about the ozone layer shrinking. Schultz says Ronald Reagan urged skeptics in industry to come up with a plan. He said, do it as an insurance policy in case the scientists are right. The scientists were right. Reagan and his approach worked. Secretary Schultz asks, why not take out an insurance policy approach climate change the Reagan way? As Slate’s Will Oremus noted on Twitter, Tapper came at the question in a very smart way. CNN finally found a way to get the GOP candidates to disagree with Reagan: point out that he cared about the environment. And as the headline of this post says, nearly every part of Rubio’s answer was a disaster. “We’re not going to make America a harder place to create jobs in order to pursue policies that will do absolutely nothing, nothing to change our climate,” Rubio said. “America is a lot of things, the greatest country in the world, absolutely. But America is not a planet.” Well, at least he got that last part right. Several things here: First, the growth of renewable energy is already a huge job creator in the United States. Last year, employment in the solar sector grew by more than 20 percent, and it is now adding jobs at a rate that exceeds the oil and gas industry. Second, the idea that the United States—as the world’s largest historical emitter of carbon dioxide—is somehow unable to motivate global action on climate change flies in the face of virtually every aspect of foreign policy in a globalized economic system. James Hansen, perhaps the world’s foremost climate scientist, has proposed a simple and elegant solution that just might work: If the U.S. and China tomorrow agreed to apply a gradually rising fee on their carbon dioxide emissions, including imports, that would instantly motivate anyone that wanted to trade with them—basically the entire rest of the world—to sign up. In a Washington Post op-ed earlier this year, Shultz himself proposed a similar idea. Rubio’s response highlights what I believe is a palpable shift in rhetoric coming from Republicans on the climate issue—what after the first debate Vox’s David Roberts called “the tightrope act of finding a moderate Republican message on climate change.” They’re starting to realize climate is a losing issue for them, and have abandoned discussion of the science in favor of spreading falsehoods about the economic cost of action. The entire climate portion of the three-hour debate lasted just four minutes. As ThinkProgress notes, about the same amount of time was spent on the candidates “choosing” their Secret Service code names. For countless people around the world—including in California, where the debate was held—climate change has an urgency on the same level as terrorism. Earlier Wednesday, a survivor of the devastating California wildfires wrote in the San Jose Mercury News: “Climate change is a nightmare that’s affecting us now.” The author, Jessica Jennings Pyska, who lost her home in a huge blaze north of San Francisco, begged the GOP candidates to engage on the issue Wednesday night. For one of the most important issues facing the world today, climate change has been getting short shrift so far in the GOP debates. Perhaps that’s not surprising, given that it’s something the GOP candidates mostly agree on. Still, American voters clearly prefer a president who acknowledges the seriousness of climate change and wants to do something meaningful about it. The problem for Republicans is all of those candidates belong to the other party.